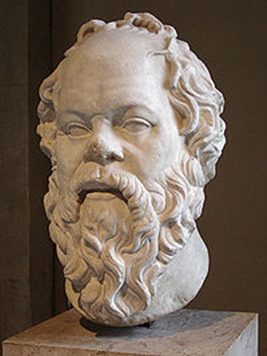 Socrates (469-399 BCE) was a Greek Philosopher who thought and taught through argumentative dialogue, or dialectic. Socrates did not write down any of his thoughts, however his dialogues were recorded by his student and protégé, the philosopher Plato (428 – 347 BCE). Here Socrates discusses the deficiencies of writing. SOCRATES: … Among the ancient gods of Naucratis in Egypt there was one to whom the bird called the ibis is sacred. The name of that divinity was Theuth, and it was he who first discovered number and calculation, geometry and astronomy, as well as the games of checkers and dice, and, above all else, writing. Now the king of all Egypt at that time was Thamus, who lived in the great city in the upper region that the Greeks call Egyptian Thebes … . Theuth came to exhibit his arts to him and urged him to disseminate them to all the Egyptians. Thamus asked him about the usefulness of each art, and while Theuth was explaining it, Thamus praised him for whatever he thought was right in his explanations and criticized him for whatever he thought was wrong. PHAEDRUS: Socrates, you’re very good at making up stories from Egypt or wherever else you want! SOCRATES: But, my friend, the priests of the temple of Zeus at Dodona say that the first prophecies were the words of an oak. Everyone who lived at that time, not being as wise as you young ones are today, found it rewarding enough in their simplicity to listen to an oak or even a stone, so long as it was telling the truth, while it seems to make a difference to you, Phaedrus, who is speaking and where he comes from. Why, though, don’t you just consider whether what he says is right or wrong? PHAEDRUS: I deserved that, Socrates. And I agree that the Theban king was correct about writing. SOCRATES: Well, then, those who think they can leave written instructions for an art, as well as those who accept them, thinking that writing can yield results that are clear or certain, must be quite naive and truly ignorant of [Thamos’] prophetic judgment: otherwise, how could they possibly think that words that have been written down can do more than remind those who already know what the writing is about? SOCRATES: You know, Phaedrus, writing shares a strange feature with painting. The offsprings of painting stand there as if they are alive, but if anyone asks them anything, they remain most solemnly silent. The same is true of written words. You’d think they were speaking as if they had some understanding, but if you question anything that has been said because you want to learn more, it continues to signify just that very same thing forever. When it has once been written down, every discourse roams about everywhere, reaching indiscriminately those with understanding no less than those who have no business with it, and it doesn’t know to whom it should speak and to whom it should not. And when it is faulted and attacked unfairly, it always needs its father’s support; alone, it can neither defend itself nor come to its own support. PHAEDRUS: You are absolutely right about that, too. SOCRATES: Now tell me, can we discern another kind of discourse, a legitimate brother of this one? Can we say how it comes about, and how it is by nature better and more capable? PHAEDRUS: Which one is that? How do you think it comes about? SOCRATES: It is a discourse that is written down, with knowledge, in the soul of the listener; it can defend itself, and it knows for whom it should speak and for whom it should remain silent. Plato. c.399-347 BCE. “Phaedrus.” Pp. 551-552 in Compete Works, edited by J. M. Cooper. Indianapolis IN: Hackett.